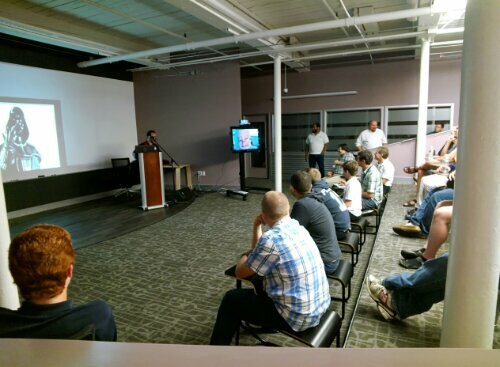 We had an awesome turnout at Dyn Thursday evening. 4 Glass Explorers and about 30 dreamers from kids to developers amd teachers. I opened by asking if I could take their picture and my screencasted view on the big screen took the photo. I’ll add that later to a gallery. Josh Cyr gave a presentation all about Glass, then we passed the Glass so everyone had a chance to try them on. We had 3 or 4 kids join their parents and the look on the faces was incredible and of course their were many, many selfies taken.